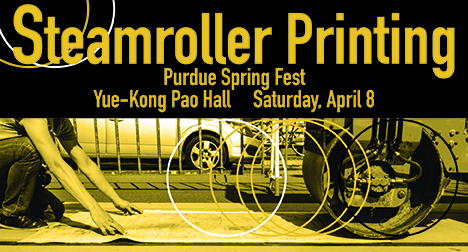 Steamroller Printing took place on Saturday, April 8, 2017 as part of Purdue's Spring Fest activities, outside of Pao Hall of Visual and Performing Arts, on the north side of the building (loading dock area). Students and artists printed throughout the day, from 10 am to 4 pm. The age-old method of relief printmaking is generally done from wood blocks or linoleum surfaces, or even from rubber stamps. Visitors were able to see block printing conducted on a large scale, with an industrial steamroller as the printing press! Various artists from throughout the area, including students from local schools, shared their large-scale blocks for printing.